STOP PRESS!!! 00:17, 02-Aug-2011: The image and PDF pattern sizes have been resolved, and the links and instructions below are now correct! 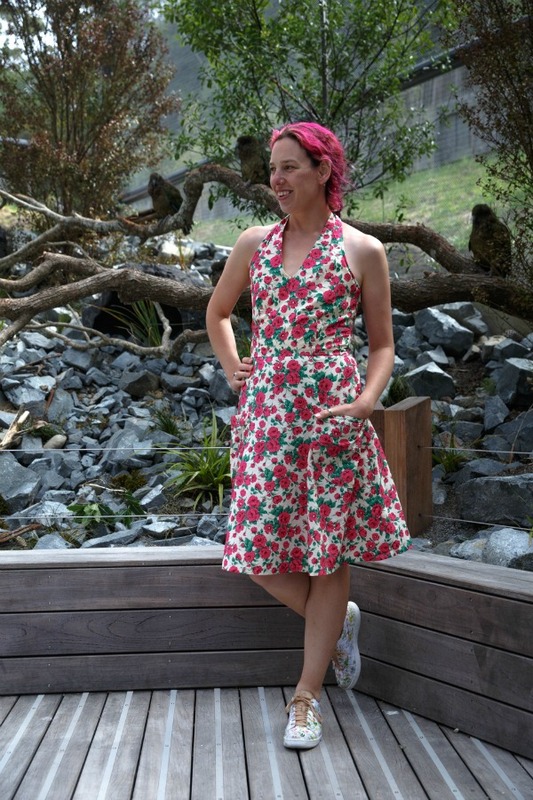 The lovely Mena of 'The Sew Weekly' is even doing a whole week of Sorbettos! Now, I was already thinking about diving in and drafting a sleeve pattern myself to go with this super little sleeveless top, however Mena has already gotten there first (yay - less work for moi ;) !). 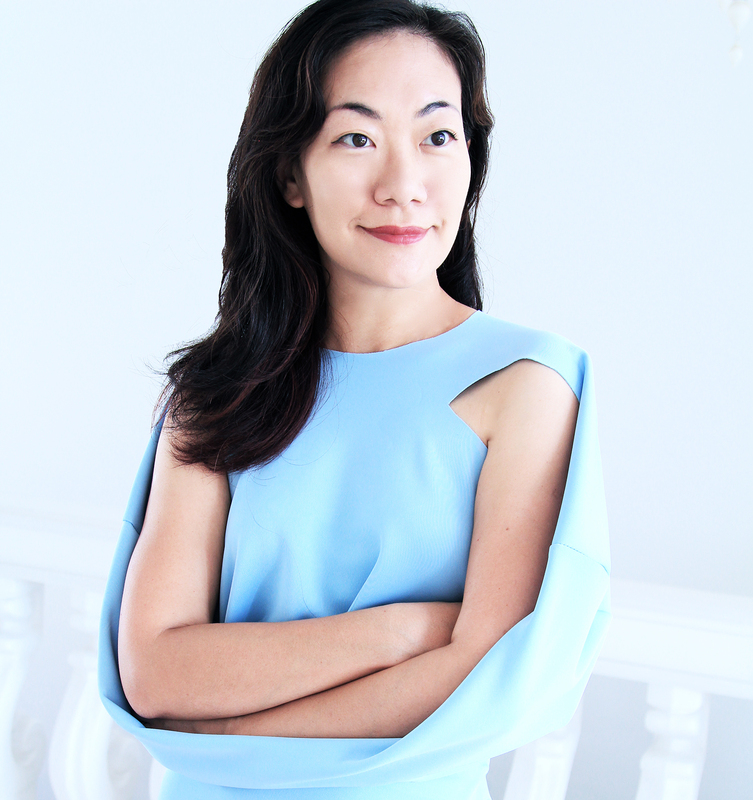 She's produced the pattern as x2 GIF image files. But, I decided it'd be easier for me to print and work with if I imported these into CorelDRAW. So, I did this and from here I added a few bits 'n' bobs of my own - and it's now been turned into a downloadable PDF file for you to enjoy. given a layout for assembling the pattern sheet pieces. • A4 format (paper size: 210 x 297mm). • US Letter format (paper size: 8½ by 11 inches). To download the PDF files, simply click on the links above - then on the new webpage select the 'Download' button in the centre of the screen. The page 1 of the PDF file is a diagram of the layout for assembling the paper sheets together to form the sleeve pattern (2-sheets, i.e. pages 2+3). (1) Print out the sheet with the Test Square (page 1 of the file). Select 'Page Scaling' to 'None' (or to 100% - dependant upon your PDF reading software). Check that the square is the correct size - 10 x 10cm (4 x 4 inches). (2) Once you are happy with your printer settings, print out the rest of the PDF file. Page 1 = Layout diagram, Pages 2 + 3 = Sleeve Pattern. (3) Layout the pages in front of you - as per the layout diagram. (4) Trim off the right-hand side margin from page 2. (5) Tape together the 2-sheets: align the solid black triangles edge-to-edge, i.e. 1A with 1A. you then overlap that onto the next sheet in the layout. 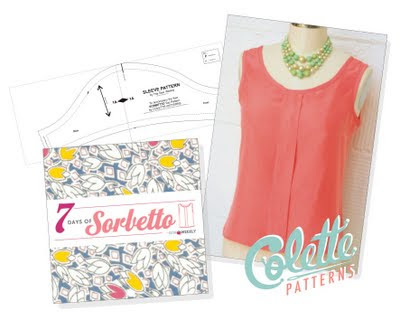 The Sorbetto top in it's original form and style is meant to be sleeveless (with the armhole intended to be finished with bias-binding), therefore as per Colette Patterns' instructions the armhole on the bodice pattern pieces has a ¼" (6mm/0.6cm) seam allowance. However, I have shown a 5/8" (15mm/1.5cm) seam allowance (stitching lines) all the way around on the sleeve pattern. Therefore, you may/may not wish to adjust the bodice armhole to increase the seam allowance and make life easier when you align and pin together the fabric pieces for stitching. Mena does not state what size the sleeve pattern is she has drafted. Though I think it should be easy to tweak! (I'll let you know how I get on when I make the sleeves myself - very soon LOL!). EDIT (30th Oct 2013): I've done a bit of measuring of the stitching-lines, and I reckon that the sleeve-pattern is most likely for the Size 6 on the pattern, with approximately 3/4" (20mm/2cm) of sleeve-cap ease. You might even be able to squeeze this sleeve onto a Size 8 armhole - without any easing at all. Remember on the sleeve-pattern the stitching line on the sleeve cap has been printed to show 5/8" (15mm/1.5cm) seam allowance... BUT that the armhole on the bodice pattern pieces has a ¼" (6mm/0.6cm) seam allowance folks!!! P.S. Out of common decency and courtesy I have of course emailed Colette Patterns and also The Sew Weekly to let them know I've made this PDF file of Mena's sleeve pattern. Thanks for doing this! :-) I've got the Sorbetto in my queue, it's just going to be a while before I get to it, LOL! Wow this is so smart, I've made 2 sleeveless Sorbettos but don't have the time/brain power to come up with sleeves so thank you very much (Mena sent me here!). I hate to point this out after all that hard work you've done, but....if each page is 11 inches in length and you have five of them lined up end to end for the bottom of the sleeve, you'll get a sleeve that is roughly 5.5 feet around at the hem. You may want to check your parameters again. Huge apologies for the mix-up guys!! I will post up the revised files on my blog & Google documents as soon as they get sorted :)! Sweet! Thank you so much for doing this, can't wait to try it out! I am in awe of anyone with the computer skills to do this! Thank you so much - I can see another Sorbetto being made in the very near future, but this time with sleeves! Yay! You are a star Claire, thank you for going to all this effort and sharing! Hey, this is so kind of you. I'm planning about 6 versions! I was thinking to draft a sleeve but was very daunted. I appreciate you taking the time to do this and sharing it with us all. Thanks for doing this. I think I prefer the Sorbetto with a sleeve and now you have made it way easier for me! Thank you! Hello! Thanks so much for making this pdf. I used it to make a sorbetto in the last few days. To answer the size question, I think this sleeve could prob. work for all sizes. I cut the pattern for my blouse to size 6, but as I felt the armscye was too small for my comfort, I cut the armhole to the largest size. I used this sleeve and it set in just about perfectly without me even stitching for ease. So, if you use it on a smaller armscye you gather or pleat as Mena did, but if the armscye is larger you can just set in as is! Thanks again- I really like this blouse! I've done the Sorbetto and was looking forward to a second one with sleeves, thanks for this!!! ^Ah, you're most welcome ladies :) Hopefully I'll get to test out the sleeve pattern myself in a week or two (once the grand sewing-room makeover is completed!). Having just tried to use this piece--actually a slightly enlargened sleeve due to a bust modification--I can say with confidence that if you are using the size 18 variation of this pattern, this sleeve will not even come close to fitting as A.J.A says. It's possible I'm totally missing something, but as far as I can tell, this doesn't work on a size 18. Thank you very much for this pattern, I've just started sewing and much prefer a top with sleeves, the Sorbetto has been a really useful pattern for me to practice on and I'm really pleased with the addition of the sleeves. Am currently working on version No 4! Thank you so much for this sleeve pattern! This was my first time ever putting sleeves on a garment and it was so great to be able to do it with a pattern I've used before - the trusty Sorbetto. I'll definitely be using your sleeve pattern again! thank you for the pattern! that is really great but may i just ask,how would i make the sleeves longer, would it work if i lengthened the sides or anything else should be done? thank you again..
wow, thank you soo much, ill be waiting for your post then. loves. 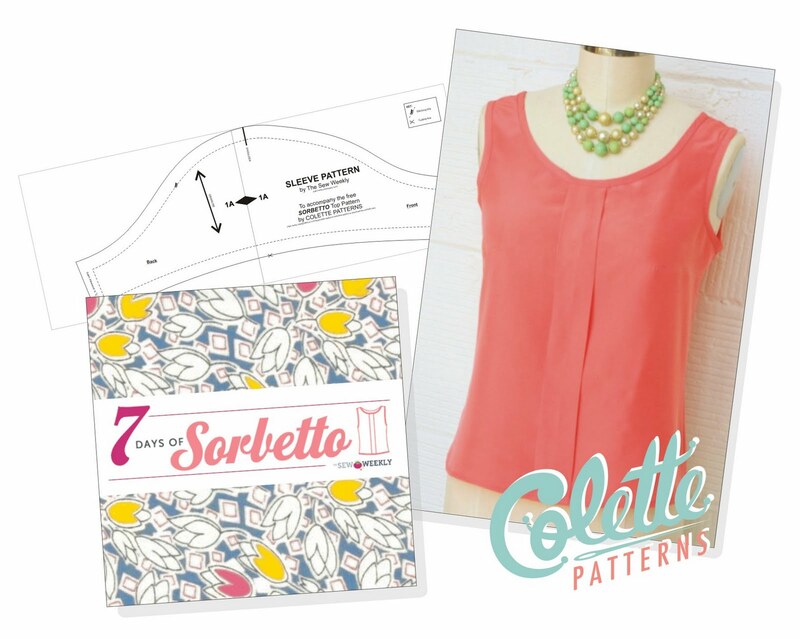 I am dying to add sleeves to Sorbetto, but I can't get the pdf to download for some odd reason. Am I missing something? Hi Janelle, Did you click the download link on the Google docs page, then get a "Save As" message please? (It's working fine for me so perhaps it's a temporary glitch.) If you email me sew[dot]incidentally[at]yahoo[dot]com I'll send you the files. Thanks, Claire! Once I saved it, I was able to open the pattern with no troubles. Thank you, thank you! You made the sleeve pattern! I vergot it but I used ist many times. Thank you for this helpful little thing. Oh, thanks for providing this! Большое спасибо! В эти выходные обязательно попробую сшить! Russian: Большое спасибо! В эти выходные обязательно попробую сшить! English Translation: Thank you very much! This weekend, be sure to try to sew! English : You are most welcome :)! Russian Translation: Вы только приветствовать :)! Russian: А рукав какого размера? English Translation: And what size sleeve? English Original: I've done a bit of measuring of the stitching-lines, and I reckon that the sleeve-pattern is most likely to be for the Size 6 on the pattern, with approximately 3/4" (20mm/2cm) of ease at the sleeve-cap. You might even be able to squeeze this sleeve onto a Size 8 armhole - without any need to ease it in all. Remember that on the sleeve-pattern the stitching line on the sleeve-cap has been printed to show 5/8" (15mm/1.5cm) seam allowance... BUT that the armhole on the bodice pattern pieces has a ¼" (6mm/0.6cm) seam allowance folks!!! Russian Translation: Я сделал немного измерения прикаточных линий, и я считаю, что рукав-модель, скорее всего, будет для размера 6 на модели, с примерно 3/4 "(20mm/2cm) легкости в рукав-колпачок. (20mm/2cm) ease in the sleeve-cap. Возможно, вы даже сможете выжать этот рукав на Размер 8 проймы - без необходимости, чтобы облегчить его во всем. Помните, что на рукава-шаблон шить линия на рукава-крышкой была напечатана, чтобы показать 5/8 "(15mm/1.5cm) пособие шва ... НО, что пройма на лифе выкройки есть ¼" (6 мм / 0.6cm) ПРИПУСКИ люди! Hi, I cut the tank patern in a size 14, and the armhole is about 23inches around, and your sleeve pattern is under 18 inches. Where on the sleeve should i add length? in the center where the pages meet at the arrow? or at the ends where the sleeve seam meets under the arm? thanks!! Hello, I wanted to thank you for this pattern. I scaled it up for my size and it worked first time. I've never done sleeves before so I am absolutely delighted. Thanks. I can't seem to access the A4 sleeve pattern, is the link still working? Hi Ingrid! The file is working fine for me. Maybe send me an email and I can send you a copy (my email address is on the top right area of the desktop version of the Webpage)? Hi there! If you would like to be notified by email when I (or anyone else) replies to your comment please click the 'Subscribe by email' link under this comment box. Double Ham on a Roll, Hold the Mayo! Feel The Fear And Overlock It Anyway! Part 2: Maybe It's Genetic? Part 1: Maybe It's Genetic? No Rules Draping, Part 2: Print Placement - Use your customized dress form to test fabric drape and placement. An Update on Our New Size Range and a Survey! - The post An Update on Our New Size Range and a Survey! appeared first on Grainline Studio.